Summer escapes were so easy when I was single. A quick conversation with my friends about which beach to hit this time (or again), a flurry of phone calls, group messages, and online bookings, and we’d be set. Throw a few bikinis and sarongs in a bag, hit the road or hop on a plane, and spend the next few days in the sun with my music and a good book, and have an occasional splurge meal and mojito. As a mom, it’s a completely different story. A beach trip with an energetic toddler in tow is a full-on production; my pack-up-and-go days have packed up and gone. Travel schedules need to consider nap times and meal times. Most of what we bring on the trip is for our daughter, Addie; where once my beach bag had only some money, an iPod, and tanning oil, it’s now filled with tiny extra clothes, swim diapers, beach toys, milk, and snacks. My husband and I travel without a nanny, so yes, we pretty much carry everything, including our bouncing baby girl, when she’s tired or just wants a ride or a better view. While we absolutely love these mini family vacations, we decided to avoid the crowds and the craziness and just stayed home this Holy Week. 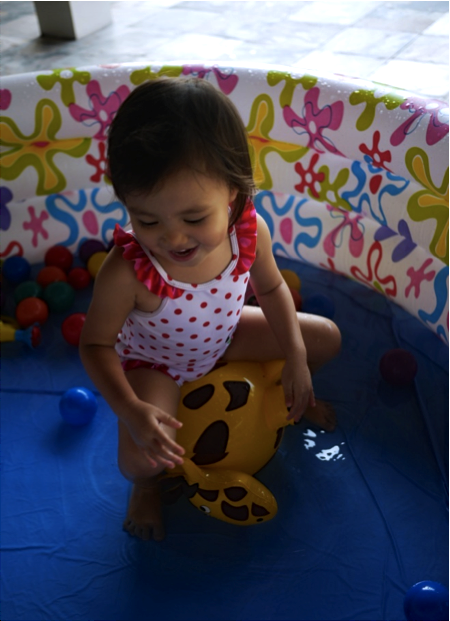 Our afternoons are usually spent doing craftsy things with Addie like playing with Play-Doh or finger-painting, but the summer heat called for the big guns – the inflatable kiddie pool! 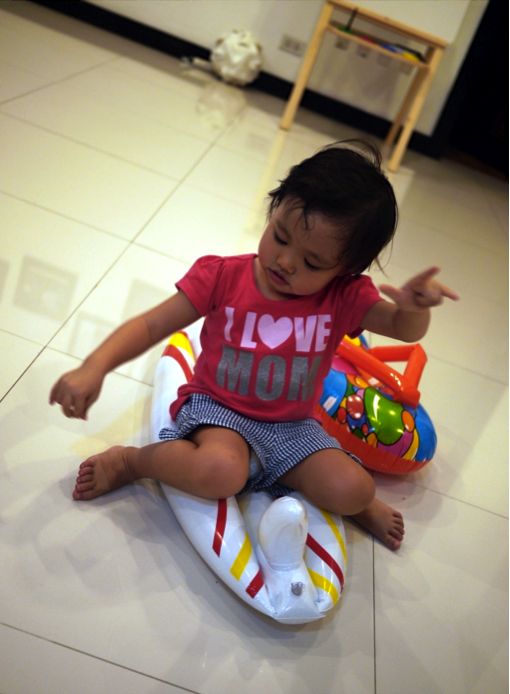 Addie is such a water baby (takes after both her parents) that she enjoys “swimming” in inches of water in our bathtub. 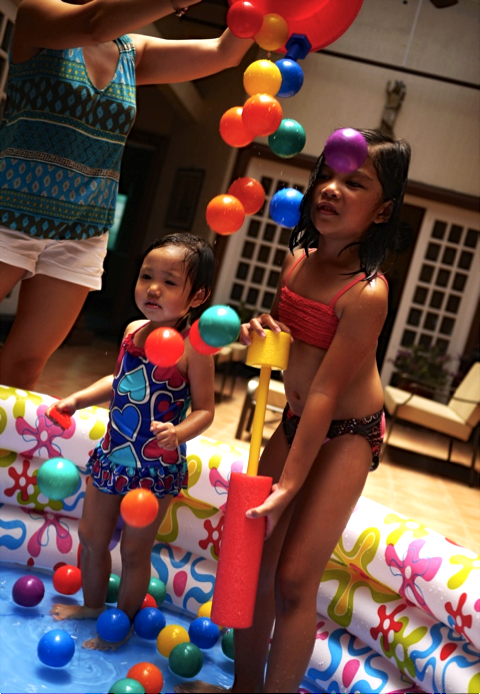 So the kiddie pool is practically a water park for her, especially with this simple “level-up” trick: lots of colored plastic balls, and a water blaster or two. The great thing about kids is that they can have fun with pretty much anything, and they don’t limit themselves to what “belongs”. 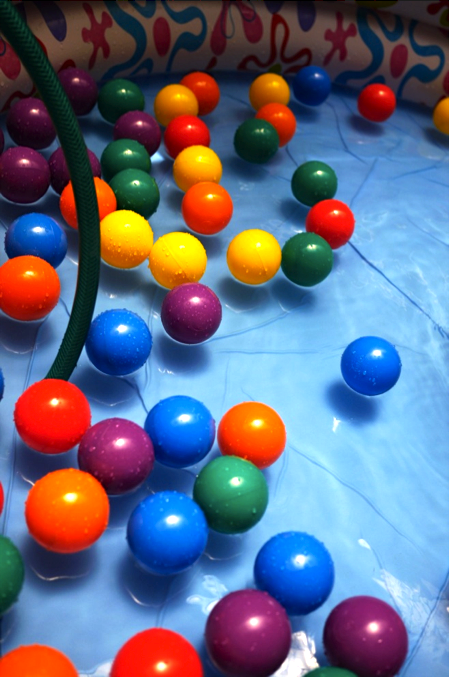 I came out one afternoon to find that Addie had done her own leveling-up – she had found her way into our stockroom and claimed some monster and animal inflatable balls to add to her own personal Splash Island. Even my husband and I love getting in the kiddie pool with her – lying down in the cool water is a great way to beat the summer heat. We don’t get to relax for very long though, because Addie loves splashing us with whatever she has handy – her toy watering can, her water blaster, or even the hose we use to fill the pool! At some point, we have to get our wrinkling little girl out of the water, but even that doesn’t stop her from keeping her DIY summer party going. 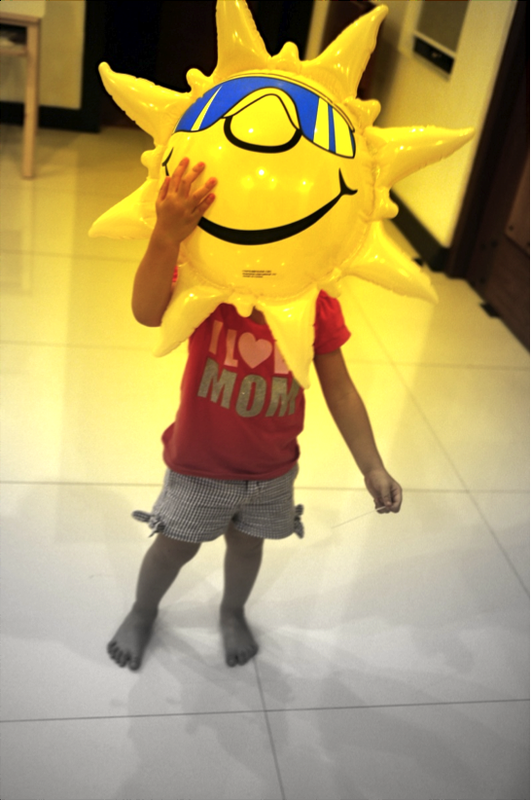 Another quick trip into our treasure trove of inflatables (she has decided that our stockroom doubles as her toy closet), and she comes surfing out with a blow-up flip-flop and a big, sunny smile. This summer, you don’t have to break the bank or your back to hit the beach. It’s easy to bring the beach to you with some DIY party favors and a lot of imagination.